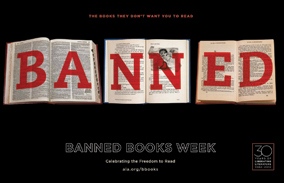 September 30 - October 6, 2012 is Banned Books Week, an annual event sponsored by several groups including the American Library Association, the American Association of American Publishers and the National Council of Teachers of English. More information about Banned Books Week can be found at their web site. Take a moment to visit the main display case across from the circulation desk and the small display case inside the library to learn more. So what does it mean to ban a book? This question can best be answered by defining a "challenge" as well. Published in 1951 and widely regarded as one of the most important contributions to American literature since WWII, this novel has been disputed in more than 70 communities in the U.S. Some school boards have banned it, while others have removed it from school reading lists or “restricted” it, requiring parental permission to read it. In Harris v. Mechanicville Central School District (N.Y. 1978), a high school English teacher was dismissed for insubordination for refusing to remove the book from his curriculum. Most challenges to the book have centered on the profanity and sexual situations. In more recent years, the book has been blamed for promoting alienation among students responsible for school shootings. Although considered one of the great American novels, this book has been banned from, and challenged in, schools and libraries since the very year it was published. Early challenges involved the language – Twain wrote in what is described as an accurate representation of people in the rural pre-Civil War South, and that the book was seen as “coarse, trashy, inelegant, irreligious, obsolete and mindless.” Later challenges have involved allegations that the racially charged language continues to contribute to negative racial stereotypes, and that Twain’s portrayals of women are negative and sexist. This 1961 Pulitzer Prize winning novel has been banned and challenged across the country for containing profanity and racial slurs. The Harry Potter series has been challenged and removed from some public and school libraries since its publication. While many are great fans of the series, saying the books have encouraged reluctant readers to read, others say that they have encouraged readers to value witchcraft, wizardry, and magic-making, and that these activities are inappropriate for young readers. The Captain Underpants series are chapter books for children that feature protagonists George and Harold, two fourth graders who are obsessed with all things grimy and gross. They created the comic superhero Captain Underpants by hypnotizing their principal who then whisks around in a red cape and a pair of tightie whities and battles such worthy foes as Dr. Diaper and Professor Poopypants while also “defending truth, justice and all that is pre-shrunk and cottony”. Although the series is wildly popular with children, it is less so with adults, who feel the books contain offensive language and model bad behavior. The books have been challenged and banned in some libraries, including an elementary school in Connecticut that banned the books because school officials thought that it was causing mischief and mayhem in their fourth-graders.